How to use URL Shortening? You'll see the 'connect URL Shortener' page. Click on the Sniply URL Shortener icon. It will take you to the login screen of Sniply. Log in with your Sniply credentials. As you log in, you will be redirected to your SocialPilot dashboard where all your accounts will be displayed. The call-to-action you created at Sniply will be displayed in the drop-down box. Select the call-to-action you want to add to the posts you share. Select the accounts you want to use Sniply for, add call-to-action on the link you share, and click on 'Apply' button. Now, whenever you post a link in the 'Create Post' section and select those accounts, it will automatically be shortened by Sniply and the call-to-action buttons you selected to for the links will also be added. Login to the SocialPilot panel. It will take you to the login screen of Rebrandly. Log in with your Rebrandly credentials. Select the accounts for which you want to use Rebrandly along with your customized domain names and click on 'Apply' button. Now, whenever you post a link in the 'Create Post' section and select those accounts, it will use Rebrandly to shorten the link along with your custom domains. 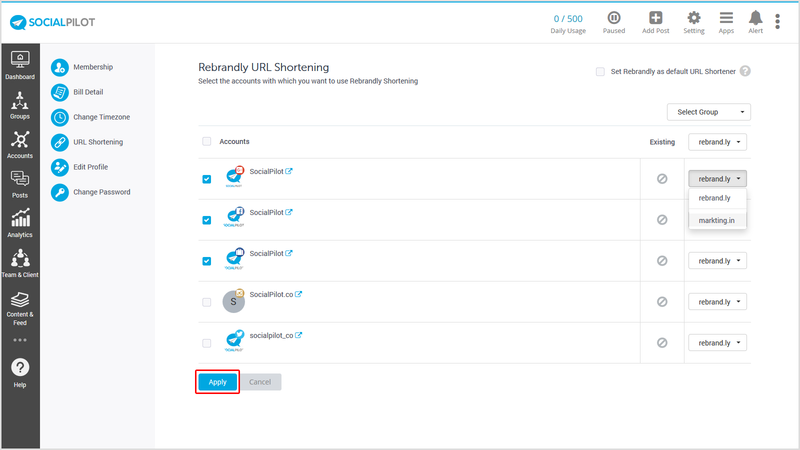 Click on the Bitly URL Shortener icon. It will take you to the login screen of Bitly. Log in with your Bitly credentials. As the Bitly authentication page appears, click on 'Allow' to give access. As you allow access, you will be redirected to your SocialPilot dashboard where all your accounts will be displayed. The domains, you created at Bitly will be displayed in the drop-down box. Select the domain you want to be used while shortening links. Select the accounts for which you want to use Bitly shortening service to with your customized domain names and click on 'Apply' button. Now, whenever you include a link in the 'Create Post' section and select those accounts, it will use Bitly with your custom domains for the links you share.